The man behind the most poignant football story of the year was once sacked by Cambridge United and spent several years getting up at three o’clock in the morning to take the rubbish out of buildings. Flamboyant Frenchman Herve Renard, the unlikely leader of the unlikeliest winners, had been a senior coach for only four years when he led a little-known Zambia squad of mainly home-based players to their first African Nations Cup title. the scene of the plane crash which killed 18 national-team players on their way to a match in Senegal in 1993.
on penalties after a 0-0 draw. Until a few years ago, Renard had really experienced the bitter side of football. At the age of 15 he had a trial at Cannes, giving him hope of becoming a top-level professional until reality quickly set in. As his playing career failed to meet his ambitions, Renard set up a cleaning business which he owned for almost a decade. “I often remember those years when I got up at three in the morning to go and clean buildings. It helps keep all this in perspective,” says the 44-year-old. However, he still saw a future in football and took to coaching French amateur sides. His breakthrough came when he was spotted by Claude Le Roy and became assistant to his globe-trotting compatriot. 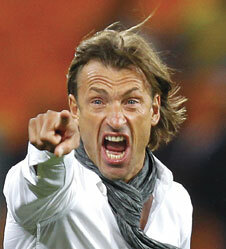 Renard finally became a senior coach in his own right when Zambia appointed him in 2008. He led the country to the African Nations Cup quarter-finals in 2010, but then quit shortly afterwards for a more lucrative spell in Angola, only to return in 2011. On paper, his squad for the 2012 finals in Gabon and Equatorial Guinea looked distinctively unimpressive. Most of the players were locally based, with a few in South Africa, China and the Democratic Republic of Congo, and Emmanuel Mayuka of Young Boys in Switzerland the only one with a European first division club. But the squad had grown up together, with most of the players having represented their country at various age levels. Renard managed to turn their unity into a key factor in the tournament. name coach would not have matched. In their opening group game against Senegal, his counter-attack strategy paid off with two early goals which humbled one of the pre-tournament favourites. Before the group game against Equatorial Guinea, he was happy to delay the start of a press conference because the Zambian press corps had not arrived on time. “This happens in Africa, we’ll give them half an hour,” he said good-naturedly. He translated the comments of his captain Chris Katongo from English into French after organisers failed to provide an interpreter for a post-match press conference, where he also revealed that he had to reign in his players’ attacking instincts. Renard had clearly won the confidence and respect of his players, coming across as a father figure who could be sympathetic but who also drew a line not to be crossed. He kicked midfielder Clifford Mulenga out of the squad early in the tournament for refusing to apologise after breaching a curfew and dropped Mayuka for the semi-final against Ghana, bringing him on later in the game. Mayuka, who has since joined Southampton, responded by scoring the game’s only goal. With Nigeria, Cameroon and South Africa all missing from the tournament, Zambia’s display showed that a team can still go a long way in African football simply by being unified and well-organised.